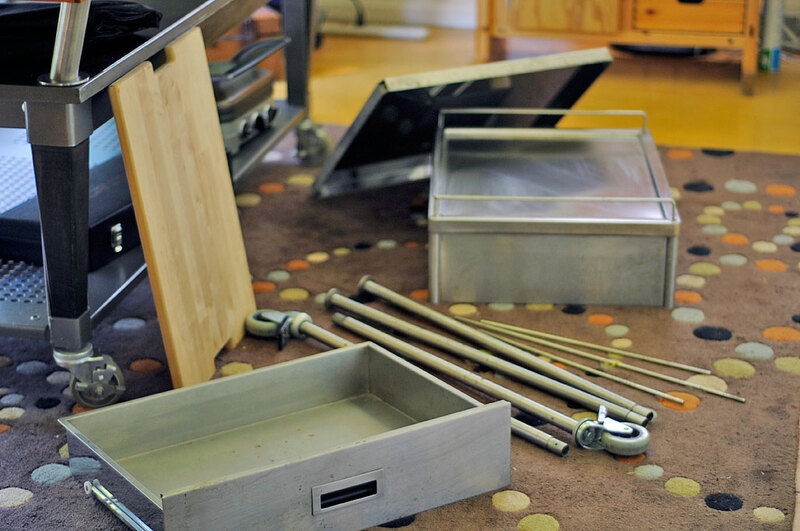 The stainless steel IKEA FLYTTA cart we “restored” a week ago was, regrettably, too large for our needs. However, as luck would have it, a smaller version of the FLYTTA was also for sale on Craigslist. With an asking price of $25 we didn’t even bother to haggle (something of which we love to do). This one even had a drawer (the current IKEA version does not). Our disassembly experience with the last cart taught us to bring along the SwiftDriver. Granted, this cart had fewer shelves and other bits, but we were glad we brought the SwiftDriver with us as it was a huge time-saver. We were able to take the cartcompletely apart in less than 5 minutes. The smaller FLYTTA has only one shelf and two wheels. However, in addition tothe previously mentioned drawer, this smaller unit also has a removable birch cutting board. Like the bigger cart, this cart also had a bit of surface rust. The type of the stainless steel used in these IKEA carts is not the same as that used by TEC in making their grills, but if they did these carts would be about $800, so we aren’t complaining. Since Brillo worked so well in cleaning the TEC grill, we decide to try using it on the rust stains. The steel wool pads work almost as well as the 330-grit sand paper: they did not dull the surface as much, but they were not able to get down to the bare metal. Still, it was good enough that we were satisfied with the results. Reassembling the cart was as quick and easy as taking it apart, especially now that we have figured out how to do it with just one person (laying on its side is the key). We only made one small mistake (easily remedied) in putting it together. Can you spot the problem? Hint: look at the rails around the bottom shelf. After using the new TEC grill a few times, we wanted a small surface next to it for plating the dishes as they were finished. While the other cart offered a lot of space, it was just not a good fit for the small deck. This smaller cart is a much better fit and a complements the grill nicely. 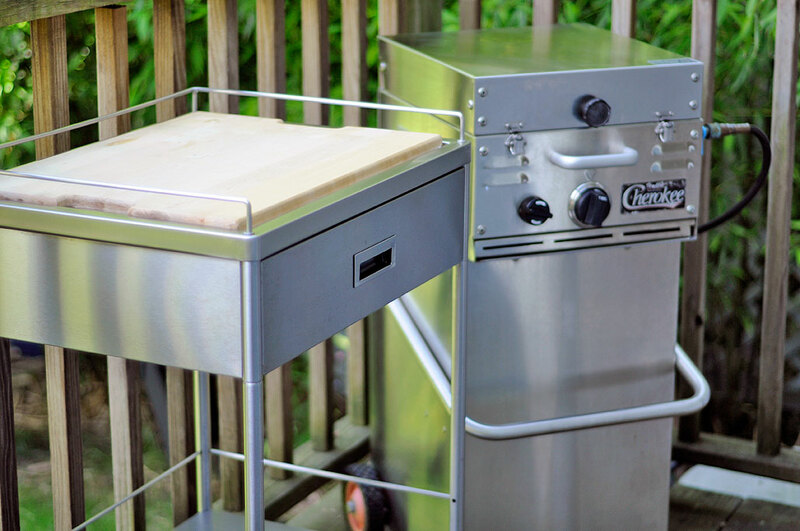 The cutting board is a feature which we had not even considered when looking for a cart. Now that we see it, it seems like such an obvious requirement. With the cart set up, everything is now ready for the July 4th cook out. We’ll will be back next week 🙂 Have a great Holiday break!! !